This past year, I’ve been reconnecting with warm glass, a.k.a. kiln formed glass. My number one creative passion is anything glass. I find glass fusing extremely fun. 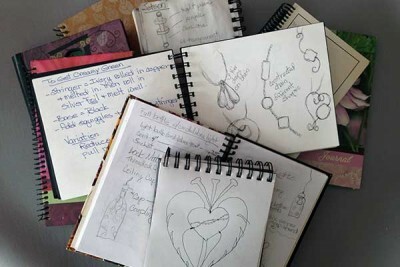 From design concept, to the finished piece, there are a multitude of steps. I always start by sketching the ideas that are always swirling around in my brain. Of course, I’m always open to the fact that the finished piece may not look exactly as planned. This is not a precise process, if it was, I would not be doing it. Next, the real fun begins! Choosing the right colors to use, although sometimes overwhelming, most times it can feed the creative juices I need to realize the piece. Now, the cutting begins. This is where I summon the safety gods. Its so easy for me to get so wrapped up in making the perfect score on the glass, that I forget that the piece can cut fingers. But hey, every smart glass artist always has a box of band-aids close by. The next step I call “assembly and tweaking”. This is where all the cut pieces come together. Of course, I have to tweak. I move pieces, replace pieces, change a color, etc. Some may call this obsessive, I call it artistic clarity. Finally, into the kiln it goes. This is where I summon the kiln gods, and pray that the piece melts the way I want it, and survives the kiln programming. I wish it was as easy as just turning a switch on. A lot goes into the different temperatures and timing you input into the program controller. With the programming, it’s the only way to attain just the right texture and shape of the piece. I would say that 98% of the time, it works out just the way I envisioned the piece. For the other 2% of the time, well, I will always find a way to re-use the glass. Most of the time, it means breaking the piece up, refusing it into a shape, and making a funky plate or bowl with it. This is pretty much an over simplification of the process, but I’m sure it gives you a little insight into what it takes to create a fused piece of art glass. A few months ago, my husband got a terrific job in Santa Fe as an Executive Sous Chef. His new position allowed me to go ultra part-time at work (2 days a week), so that I could concentrate on my artwork. Its amazing how having the extra days in my studio has helped my creativity. All these ideas keep popping into my head. The one thing that I like to do is to write or sketch my ideas. I always have a sketch pad by my side. Whenever an idea flows through my head, it makes it into my pad. I have a dozen sketch pads from the many years of creating art. A while ago, I went through all my sketch pads, and was amazed that 99% of the sketches and notes came to fruition. I highly recommend keeping notes, it really does work! Stay tune! More Creative Musings on the way.